Built by the Portuguese and later conquered by the Dutch before being eventually handed over to the British, the Fort is considered to be one of the best examples of 17th century colonial fortification. 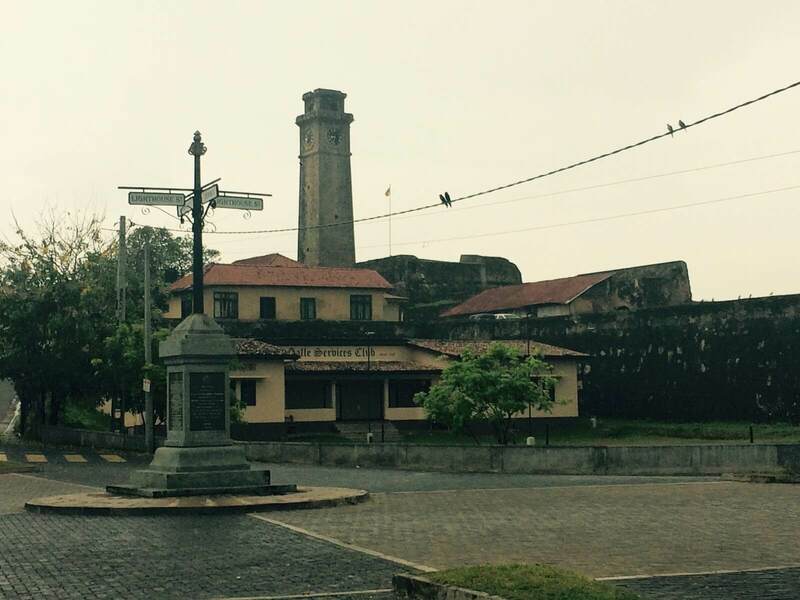 Portuguese explorer and military commander Lourenco de Almedia first arrived here in 1505, taking shelter in Galle’s natural harbour from a storm in the Indian Ocean. Legend has it that the lost captain heard the sound of a cockerel which led him to the shore; and he named the area ‘Gallo’ after the Portuguese word for cockerel. The Portuguese recognised the significance of having a base in Ceylon (as Sri Lanka was formerly called) which was quite literally at the centre of the world, and built a rudimentary fort to protect the harbour. A prized possession, it was only a matter of time before the Dutch East India Company seized the Fort and established control over it. Much of what is left of the Fort today is from the period of Dutch rule. Today, the city of Galle resembles any middle tier city in India, where chaos reigns supreme. But once you enter the Fort from one of its two gates, another world awaits you — one that is blissfully time-warped. As I stand at the Law Court Square, a large open cemented square, watching local lads play a game of cricket in the shade of a centuries-old banyan and rain trees, it’s hard to imagine that it was right there that courts dispensed justice and those found guilty met their end with the guillotine. The Fort continues to draw people from far and wide, because of the ease with which it straddles the past and present. Over a 100 families have been living in the Fort for generations — three of them have been there since the time the walls were first built. Walk into the Historical Mansion on Leyn Baan Street, a restored Dutch house, to travel back in time. One of the oldest families at the Fort, gem merchants Kamal Hussain and his father have painstakingly collected coins, typewriters, cameras, china, weapons, vessels and more over the years. The well in the courtyard of the house dates back to the Dutch period and is still in use today. The best way to experience the Fort is to walk down its cobbled streets, get lost and find your way back. Drop into one of the many cafes and restaurants run by the locals, that not only serve lip-smacking Sri Lankan and fusion food but also tuck away many an interesting tale. The Heritage Cafe with its ochre walls and a bright red postbox right outside was the original Fort bakery and still houses the original wood fired oven. As the sun goes down, locals flock to the walls to enjoy stunning ocean views, gossip, play cricket and indulge in street food fresh off carts. Here you will find women selling saris and handmade lace, and men selling treasures washed up by the sea, some of which they claim to have retrieved right from the ocean floor. If you are lucky you can catch local lads, fondly referred to as flying men, leap off the Flag Rock end of the Lighthouse Bastion. Every jump into the roaring sea below between treacherous rock outcrops is a leap of faith as no safety equipment is used. As the call to prayer from the local mosque rings through the air, men and boys dressed in their crisp white kurtas and head caps scuttle in the direction of the Meeran Mosque. While down the road, at the Sri Sudharmalaya Buddist Temple, the head monk lights lamps for the evening prayer. Within the Fort, people of all faiths coexist in perfect harmony, because what binds them all is a unique culture of the Fort. I smile as I learn my greatest lesson yet — the Fort and its people tend to work their magic on you unfailingly. This piece appeared in the Leisure section of the Sunday Mumbai Mirror, dated 14th February 2016. Nice to know about Galle fort in detail. Good one, Chaitali. Well Presented, Chaitali.. Timely Info! Thanks Sreedhar! Glad you enjoyed it! What a beautifully written piece. Thanks for sharing such well crafted post on Galle Fort, I love such historically important and faded by time, places! Me too! It really is a gorgeous place. Thanks Jatin! loved every bit of the post. Thanks Suman! So glad you enjoyed it!